The last season of Game of Thrones is coming! 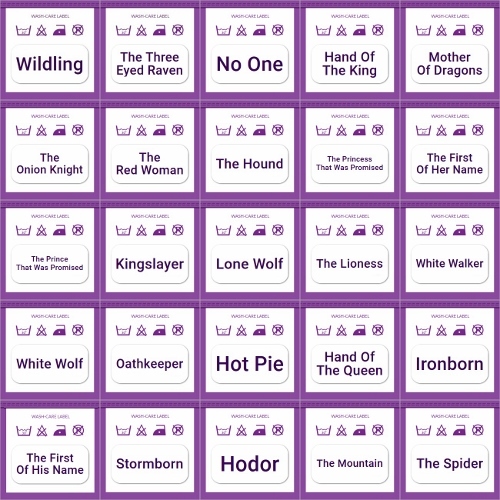 There are plenty of theories flying around as to who will win the throne, so we thought we’d make our own prediction - inspired by our name labels. To mark the upcoming release of season 8, HBO released 20 “For The Throne” posters – each featuring a character who may (or may not) be in the running to end up on the throne. To make our prediction, we’ve compared these character’s names to the names we’ve printed onto name labels since 2011 (when the show first aired) with the most popular name being our predicted winner! 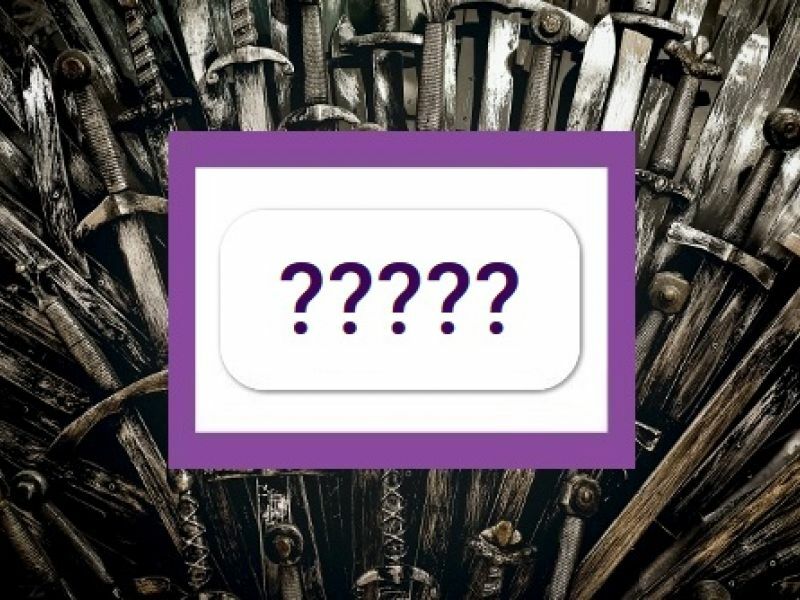 The contenders are: Arya Stark, Bran Stark, Brienne Of Tarth, Cersei Lannister, Daenerys Targaryen, Davos Seaworth, Euron Greyjoy, Greyworm, Jaime Lannister, Jon Snow, Jorah Mormont, Melisandre, Missandei, The Night King, Samwell Tarly, Sansa Stark, The Hound (Sandor Clegane), Theon Greyjoy, Tyrion Lannister, and Varys. So, which character will end up on the throne (according to Stikins customers anyway)?! Our “winner” (by a huge majority) is The Night King, with Jon Snow and Arya Stark fighting it out (!) in a close battle for second and third. Your runners-up include Jamie Lannister, Samwell Tarly, Theon Greyjoy, Bran Stark, and Tyrion Lannister. Of course, we’ll have to wait until May to find out if our customers have helped us to predict the outcome correctly…. Customers often ask us what they can include on their name labels and what font size will be used. Our system automatically selects the largest font size that will allow your personalisation to fit onto your name labels (which are 30mm x 15mm). This means the more characters you request, the smaller your font size will be. So how do you get the best possible font size AND make your name labels as useful as possible? You can choose one line or two lines of text. Each line can hold up to 27 characters (we recommend 20). If you use two lines, both lines are printed in the same font size. Capital letters take up more room than lower case letters. If you are using no more than 12 characters in TOTAL, use the one line layout to get a larger font. Examples: Hot Pie (7 characters) works best on one line, while Samwell Tarly (13 characters) works best on two lines. Queen Daenerys Stormborn of the House Targaryen, the First of Her Name, Queen of the Andals, the Rhoynar and the First Men, Lady of the Seven Kingdoms and Protector of the Realm, Lady of Dragonstone, Queen of Meereen, Khaleesi of the Great Grass Sea, the Unburnt, Breaker of Chains and Mother of Dragons, on the other hand, is never going to fit – so you’ll need to pick and choose the names (and titles) you include carefully. Most Stikins are used in school environments – where a name alone (first name and surname) is usually enough to reunite lost items with their rightful owner. You can also use alternative versions (incorporating middle names/initials and nicknames, for example) if a child is better known by a nickname or shares their name with other children in their class / school. Examples: Brandon “Bran” Stark, Jon “Greatjon” Umber and Jon “Littlejon” Umber, or even (if you’re feeling particularly regal) Aegon Targaryen / Sixth Of His Name. If you want items to be safe elsewhere OR you have a specific purpose in mind for your name labels, use the two line layout to add TWO pieces of information. This could be a name and a piece of contact information; we recommend a phone number – two phone numbers doesn’t fit well and home addresses/email addresses tend to use up too many characters. You could also use a class name / year group for a school or a room number for a residential care home or nursing home. You can even create medical alert / allergy warnings. While the print preview is for illustration purposes only, it does give you a very close approximation of what your personalised name labels will look like. Try a few options to see which combination of characters and text gives you the perfect personalisation. Use our online order form to start ordering your own set of name labels today. The print preview will automatically update as you enter your personalisation into the “Enter Line 1” and “Enter Line 2” fields. Use the toggle above the fields to switch between a one line and a two line layout.